Servicing the state of New Jersey and Bucks County, PA, our approach is simple: Offer the highest quality swimming pools, spas and related products at affordable prices. Our first location was on Kuser Road in Hamilton Township, NJ. Our new showroom in Robbinsville, NJ is open and ready to serve our customers. 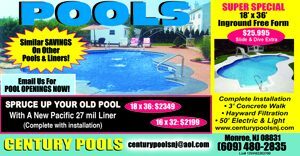 We would like to thank all our loyal customers throughout the years, and are looking forward to providing excellent service and quality products in the upcoming pool season.